There is hardly a more ridiculed single biblical verse than Leviticus 19:19. It forbids the interbreeding of different kinds of animals - but people have always done it and so did ancient Israelites when they kept their mules. It forbids sowing fields and gardens with different seeds and plants - we do it all the time and so did ancient Israelites when, for instance, they trained their famous grapevines on fig-trees. And finally it forbids wearing clothes made of a mixture of different fibers - we do it all the time and ancient Israelites certainly made such fabrics when they wove together linen tassels and wool on the fringes of their clothes. So what is going on here? Some fundamentalists labor hard to preserve any semblance of Biblical inerrancy, while anti-fundamentalists and atheists gleefully point out this anachronistic nonsense. I find both approaches unsatisfactory and, frankly, sad. I am convinced that proper biblical as well as anthropological exegesis of this verse can open for us new and important insights. And here I continue with one of the reasons why I personally consider GMO being problematic technique. It is a little troublesome but important story about our relationship to the natural world around us and why I personally think we need to challenge the thoughtless acceptance of GMO technology on the most elemental, moral or religious level. A parishioner in one of my previous churches happened to be an University Professor of biology. One day she shared with me her scientific experiments in the field of genetic modifications of cultural plants. I do not remember exactly what the plant was but I think her laboratory experimented with one of the cereals. They were attempting to insert into this plant some kind of a foreign gene, most likely something "useful" like being resistant to poisonous herbicides or perhaps to add the ability to fluoresce in dark ;-). This new foreign gene was implanted, I believe, by using a virus. But they did not have, or did not care about having, much control over the exact location of these implants. In the blind manner of trial and error they implanted hundreds of seeds. In many seeds their newly inserted gene interrupted an important genetic sequence, in some other seeds it displaced some other essential genes of that plant. You might say that I have a way too thin skin, but I could not accept that amount of artificial, unnecessary, manmade suffering, be it caused "only" to plants. This laboratory stage is seldom shown and hardly ever known. And this is just the first step in production of a Genetically Modified Crop. Many more steps are needed, with similar pain or risks not only to the targeted plant, but also to surrounding plants, insects, animals, in short, to the entire environment, including farmers and society at large. I am not against science, but observing this experiment I experienced the visceral moral revulsion against science which is profit-driven and this inhumane. * Powerful and moneyed GMO companies are suing their opponents up and down, left and right, but to my best knowledge their lawyers are toothless against this kind of religious arguments. 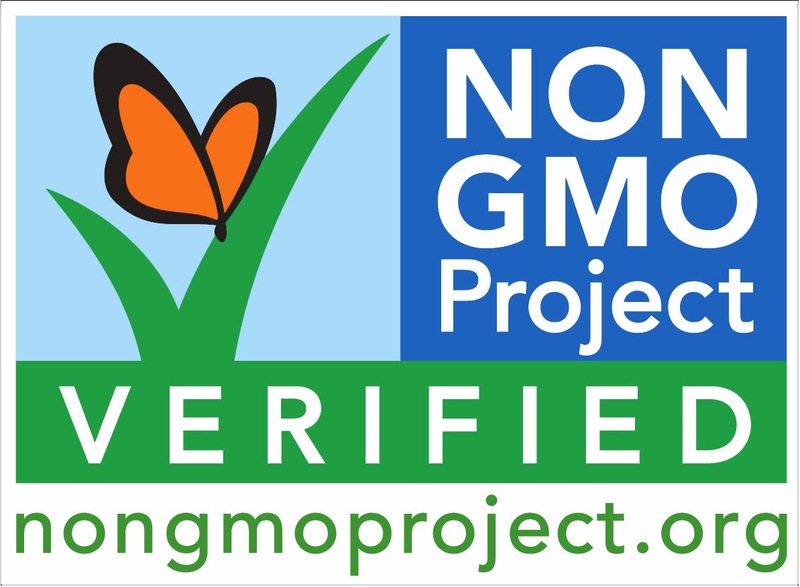 It is somehow tongue-in-cheek, I know, but I stay by it, GMO is against my religion! 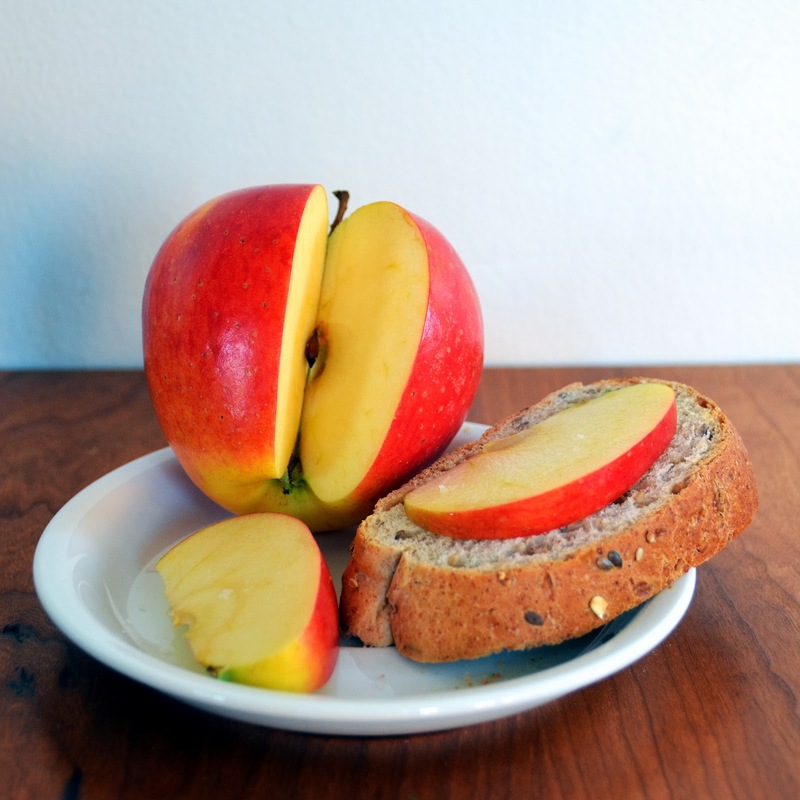 A wedge from an apple on a slice of bread. This simplest of fares reminds me of my most delicious lunches. I shared them with my maternal grandfather while tending to his beloved orchard. He attempted to initiate me into the mysteries of orcharding, caring for trees, even the miracles of grafting. I was too young to really learn anything. But it did instill in me a great respect for trees and for the craft of orchard-tending. Yet, best memory for me was our lunches: bread and apples and two-three grains of salt which made this simple meal burst into fireworks of flavors. Since that time I have eaten some exquisite, expensive and exotic meals. During my study in Edinburgh, I represented my Czech denomination at the General Assembly of the Church of Scotland and was invited by His Grace, Lord High Commissioner, to the Royal Banquet in the Palace of Holyroodhouse. I have also eaten in Michelin-grade restaurants as well as in some exotic eateries around the world, but no gastronomic experience could get even close to this simple slice of bread with few slices of apple and grains of salt which we ate together in the orchard. I am certain you share some similar experiences, if not gastronomical, then in some other aspects of your lives. As we continue investigating Mahatma Gandhi’s Seven Blunders of the World, this Sunday we will ponder “Pleasure without Conscience.” And we will again try to approach our theme from the positive angle, searching together for what establishes genuine pleasure, and how heaven-ordained it is that pure pleasure is often very simple and cannot be bought. “What is your definition of sin?” I was asked while being examined by the room full of church officers of the New York City Presbytery before being allowed to joining this presbytery. I told them the story of my previous upstate New York home. I served a church in Binghamton, but we lived in a nearby city called Endicott. It had been a cradle of a famous and powerful computer company. Most of the first American computers were made right there. Before soldering their circuit boards, they needed to be degreased. The firm was a recipient of generous military and government contracts and thus could afford only the “best” and strongest solvents and did not need to reuse them. Solvents were dumped to the ground around the factory, a practice which continued for decades. Then the town children started to get sick with otherwise rare cancers. A study was done, and a cluster of serious illnesses was discovered even among adults. The company kept these first studies secret and quietly attempted to camouflage some of their poisonous tracks in a vain hope that the problem would go away. It did not. Eventually the ugly truth came out. But by that time, the company had moved all their business away from Endicott. They are all but gone from there, leaving behind an underground toxic plume, a large ecological and environmental disaster. Thankfully local activists and New York State laws forced them to shoulder at least some of the clean-up cost. But why am I telling you this long story? Because this is what modern industrial large-scale sin looks like. It often starts with the arrogance of wealth and power, it is fueled by negligence and disrespect for the environment and people. It is prolonged by conspiracy to hide disastrous consequences and by the avoidance of taking responsibility. It finally leads to serious harm to the innocent and is very difficult to clean up or at least mitigate. Our modern pollution is unfortunately quite a fitting modern parable of any sin large and small; it can persist underground for long periods of time, has serious harmful consequences, more often than not for those who did not cause it. 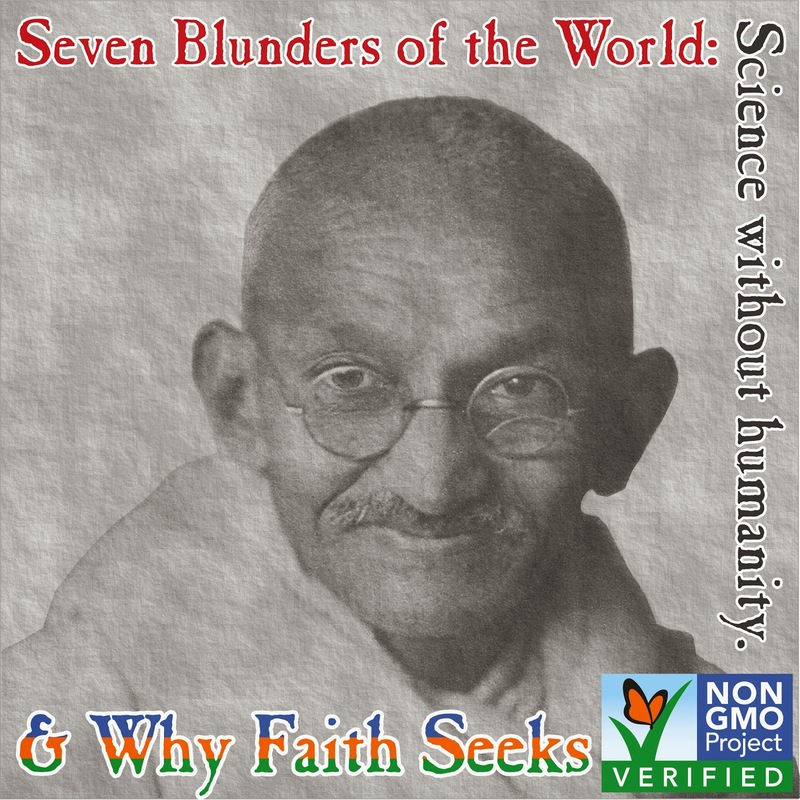 This Sunday opens a series of sermons inspired by Mahatma Gandhi’s Seven Deadly Sins (also known as Seven Blunders of the World) first published in 1925. 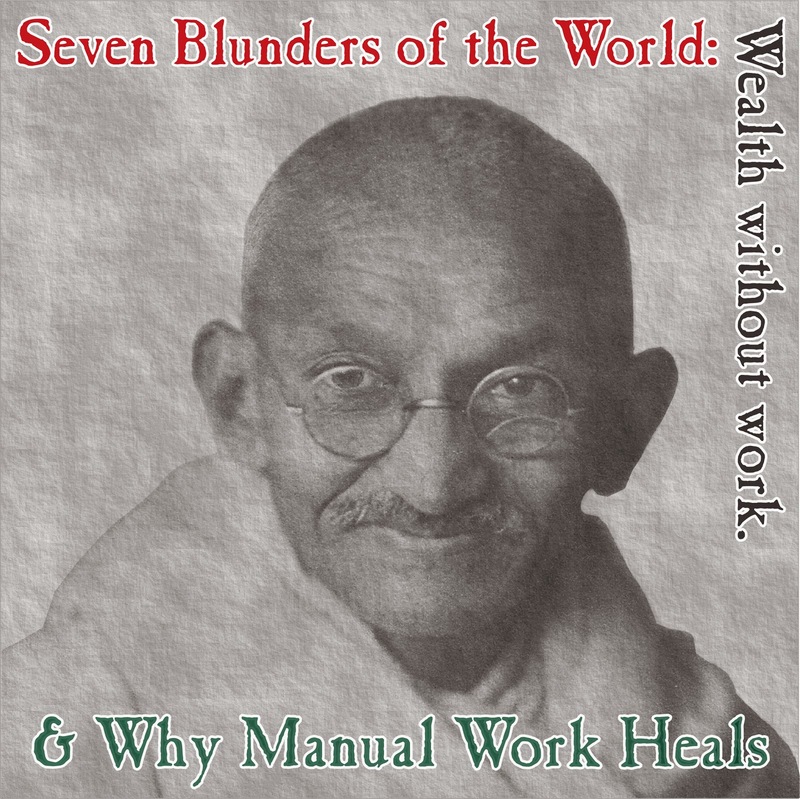 (We will depart from this theme only for few special days like MLK or Evolution Sunday) but this Sunday we start with the first Blunder of the World - “Wealth without Work” and we will also ask “Why is it that manual work heals?” In hope we can also find some antidotes. A scholar sits in his study, struggling with a biblical translation, searching for the best fitting words. It should not have been a big problem; it is a short simple sentence composed of the most basic words. This is a famous introductory scene in the drama by Johan Wolfgang von Goethe and the scholar is named Doctor Faust. He translates opening sentence of the Gospel of John: “In the Beginning was the Word.” Doctor Faust tries to find a better translation. He is not much happier with his second attempt “In the Beginning was the Thought.” Then he tries “In the Beginning was the Power.” before he finally settles for “In the Beginning was the Act.” And only few poetic sentences later Faust is talking with Mephistopheles, the devil himself, and soon Mephistopheles would hold a contract signed in Faust’s own blood. “You see!” The fundamentalists exclaim, all exited (at least those few who know Goethe’s Faust.) “You see, such loose and willful translating can only lead to dreadful ends!” But is it really as simple as that? Johan Wolfgang Goethe was certainly learned enough to know that the Hellenistic LOGOS represented more than any German “das Wort” or its direct English equivalent “the Word”! Doctor Faust might had been translating to fit his own agenda, nevertheless he was trying to solve a real and truly exciting conundrum. Our lectionary biblical reading on Epiphany prescribes for us the same biblical text and the very similar task. We will attempt to extrapolate this beautiful and deceptively simple Johanine hymn into our modern idiom while avoiding the Faustian trap (self serving translation).